Central Park Lofts is a 35 unit loft project that was completed in 2002 in the Poncey Highlands neighborhood. 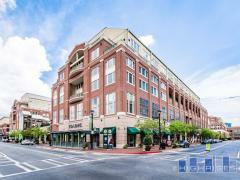 They are ideally located in Atlanta with easy access to Downtown, Midtown, interstates, shopping and dining. These lofts are spacious with ceilings more than 10 feet high and floor-to-ceiling windows that provide stunning views of the city. Large balconies help to provide a feeling of openness to these units, which range from just under 1,300 square feet to nearly 1,600. With luxurious master spa bathrooms, stainless steel kitchens, walk-in closets, fireplaces and exposed brick walls, Central Park Lofts are designed for the owner who desires comfort and sophistication. Underground parking, controlled-access entry, elevators and a fitness center with a sauna are additional amenities. Have any comments or questions about Central Park Lofts? Ask your question and/or share your thoughts about this Building.